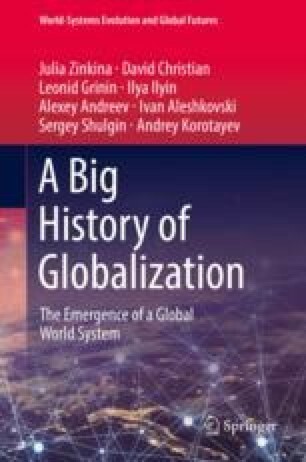 This chapter examines several consecutive periods of the earliest history of globalization. In the ninth to seventh millennia bce, an Afro-Eurasian network emerged. Although it formed slowly and was a loose entity, it nevertheless functioned as a means of spreading innovation. Indeed, it transmitted information and ideas from one society to another, thus enabling the diffusion of technologies and innovations such as domesticated plants, animals, and metallurgy. This chapter traces the origins and diffusion patterns of some of these innovations (such as some crops from the Near Eastern “founder crop package,” some animal domesticates, as well as copper, bronze, and iron metallurgy, war chariots, and some luxury goods). The most important stages in the evolution of ancient globalization were related to the “Urban Revolution” (fourth to mid-third millennia bce), and subsequently to the emergence of agrarian empires (1200 bce–150 ce), which increased the density and variability of interconnections between the societies of the Afro-Eurasian world-system.